The legend of a boy lost in the jungle lives on, even 104 years after it was first introduced by Edgar Rice Burroughs. Deeply rooted in the popular culture around the globe, Tarzan has received another great tribute thanks to Microgaming and their branded Tarzan slot. The recently launched Tarzan, comes with the host of exciting features which will take you on an eventful trip into the jungle for some fairly rewarding wins and payouts. Set beneath a big tree, five reels and three rows of this jungle fun are filled with symbols that go perfectly with the theme. Wild animals, classic casino fruit symbols as well, together with Archimedes, Jane and Tarzan of course, all joined by the Logo Wild and a colourful wheel as a Scatter. Animated character of Tarzan is on the left side of the reels to keep you company through the spins as you go about the attempt to notch at least three matching symbols from left to right on a payline to land a win. You should keep an eye on the Wild symbols during the base game as they come about as stacked symbols which will significantly enhance your chances of landing substantial wins depending of course on the bet you stake, ranging from $0.40 to $40 as the top bet. Tarzan slot RTP stands on 96%. It’s pretty ok, but a bit below fellow Microgaming slots, such as Hot Ink or Extreme Heat with 97.5%. That Bonus Wheel Scatter is the symbol responsible for all the fun in this slot game. Three of those will bring a big Bonus Wheel to the reels with Tarzan spinning it to reveal which prize and/or bonus you will land. Jackpots worth from 200x to whopping 1,000x the total bet are on offer, together with multipliers which award cash prizes going up to 18x your stake. Third in line is the Pick-a-Potamus Bonus Feature which will take you to a pond filled with sleepy hippos, which will open their mouth at your pick to reveal instant cash prizes. Ultimately, the Wheel comes with the Free Spins pick which rewards you with 12 complementary rounds of rolling, cascading reels which come with growing wilds which start from a single one available on the grid and go all the way up to 15 of those actively increasing your chances of hitting great wins. Great free spins feature! 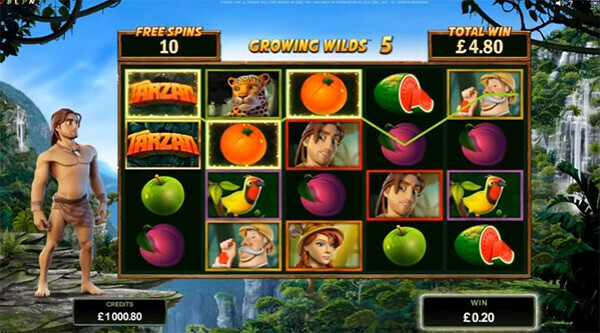 Microgaming have put in quite some effort to make the official Tarzan slot pop up. This 2016 release is bound to have a huge audience and act as an additional boost to the highly popular brand. Four different Bonus Features, engaging graphics and gameplay in addition to whopping payouts worth 23,750 x the stake are enough of incentives to have you sit down and spin those reels. If you like Tarzan slot and wish to play it for real money, don’t forget to do that only in reputable casinos that cashout fast!